The question, on the surface, appeared to be a routine one. But the answer provided by Dale Earnhardt Jr. was far more revealing. In the second question of his media availability on Friday at Richmond International Raceway, Earnhardt was asked, "What has been the secret to your success so far this season?" Certainly nothing controversial and an easy opportunity for Earnhardt to talk about his relationship with his new crew chief, Steve Letarte, and his new team. His answer, however, was far more complex. "It’s because I am the only one under the pressure to keep it up. Probably, so I hope I can come into the next race and keep up the consistency and do it again, and do it again. I don’t have the time to be worried about anything else other than just trying to keep going. So, it’s a lot of pressure to try and keep going and try to keep up the expectations that everybody has for you," Earnhardt said. "When we accomplish certain goals like when we win a race or a couple of races, or make the Chase, or win a race in the Chase or battle for the championship … those are the kinds of things that I can be excited about and be happy with and I will enjoy those moments. And I am happy to be consistent but we still have another step to go and still we are running 7th, 8th, 9th and 10th at Texas when we should be running 3rd, 4th, and 5th you know? Earnhardt's answer was very telling. For one, it's clear he is not satisfied. And she shouldn't be. He's shown he can make repeated trips to Victory Lane. And he's also aware of the enormous expectations his fans and all of NASCAR have for him and understands those won't be satisfied just with good finishes. Is it time to panic at Joe Gibbs Racing? Is it time to hit the panic button at Joe Gibbs Racing? Kyle Busch doesn’t think so. Busch, the only JGR driver to win a Sprint Cup Series race this season and the only one in the Top 16 in the series standings after eight races, is certainly a good indicator the organization has the ability to compete for a championship this season. However, Denny Hamlin, who finished runner up to Jimmie Johnson in the title hunt last season, is 17th in points with just one top-10 finish. Joey Logano is 24th in points, also with a single top-10 finish. Busch is currently sixth in points with four top-five and five top-10 finishes. “I think we’ve had really good race cars. We’ve been fast and we’ve been competitive and we’ve been able to win, finish top three, be right there and have circumstances not go our way,” Busch said Wednesday at an event in downtown Charlotte promoting the May 21 NASCAR Sprint All-Star Race. Busch said there are far more things working well at JGR than problems and is confident his teammates have the tools to perform as well as he has this season. It’s just a matter of working through the problems and getting better and as the season progresses, try to get all of us in the top-10,” he said. This weekend should provide a telltale sign for Hamlin with the Cup series running in Richmond, Va. Hamlin has won two of the last three races there, including last fall. Busch won the race last spring. Time again for "Dale Earnhardt Day"
The annual celebration of "Dale Earnhardt Day" which coincides with the late seven-time NASCAR champion's birthday is set for 9 a.m. to 5 p.m. on Friday at Dale Earnhardt Inc. facilities in Mooresville. This year, fans will be allowed access to extra exhibits, including the private oil painting of Dale Earnhardt by renowned artist Denny Dent. This original portrait permanently hangs in the corporate offices of DEI and will be placed on public display for the first time, accompanied by the 5-minute video of Dent actually painting the portrait on stage during a special event. The DEI Museum will be opening a new display that includes many of the gifts and tributes sent to and left at DEI and in other venues across the nation in honor of Earnhardt’s life. One of the new 2011 "Intimidator" Camaros will be featured in a fundraising raffle to benefit the Dale Earnhardt Foundation, with ticket sales starting on Dale Earnhardt Day. There will be lots of music, with live performances by "Eddy Francis & Freight Train", and an encore showing of the 2003 Dale Earnhardt Tribute Concert Film. Autograph Sessions will be held throughout the day, with guests including Kerry Earnhardt and Taylor Earnhardt. An annual tradition of Dale Earnhardt Day, cupcakes will again be provided to all in attendance in honor of The Intimidator’s birthday. Prizes will be given out throughout the day to those in attendance, including items from the NASCAR Hall of Fame, Carowinds, and the Kannapolis Intimidators baseball team. Admission is free. DEI is located at 1675 Dale Earnhardt Highway #3, outside of Mooresville, N.C.
Wendell Scott never got the trophy he won for his lone victory in NASCAR's Cup series. He's not getting an easy ride toward a nomination to the NASCAR Hall of Fame, either. Another group of 25 nominations to the Hall were released on Tuesday night and again Scott's name was not among them. There have been 35 people nominated to the Hall since its inception and 10 inducted. And Scott remains in neither category. Why is Scott's omission so glaring? For one, he has been hailed by NASCAR officials time and again as a pioneer for African-Americans in the sport. He is the only African-American driver to win a race in NASCAR's national series. He made 495 starts at what is now the Cup level between 1961-73. He had 147 top-10s and one pole. The Danville, Va., native died in 1990 at age 69. On Dec. 1, 1963, Scott won the Cup race at Jacksonville, Fla. He was not announced as the winner of the race at the time as the race promoter did not want to stir racial tensions at the track. Buck Baker, the second-place driver, was declared the winner until NASCAR issued a correction a few days later. Based on statistics alone, Scott probably isn't worthy of Hall consideration, but his imprint left on the sport was much larger than his lone victory. Late last year, NASCAR in conjunction with Max Siegel Inc. took the idea of a docu-drama about Scott's life to ESPN. The network agreed to run it, and it was produced by the NASCAR Media Group and aired the night of this season's Daytona 500. "Wendell Scott’s legacy will live on forever as the man who broke NASCAR’s color barrier and whose courage and bravery paved the way for minorities to pursue careers in the world of motorsports,” Paul Brooks, senior vice president of NASCAR and president of NASCAR Media Group, said at the announcement of airing of the special. Siegel was the executive producer of the film and founder of Revolution Racing, which today provides competitive race cars to further develop the skills and capabilities of minority drivers seeking to compete in NASCAR. In March, all Sprint Cup and Nationwide cars competing at Las Vegas Motor Speedway were adorned with a commemorative decal bearing the image of Scott in honor of the 50th anniversary of his first start. Obviously, NASCAR believes Scott's legacy and contribution to the sport is worthy of high honors and recognition. The argument here is not that Scott should already be inducted into the Hall, although I think he should. Scott can't even get nominated - named someone worthy of possible induction. In its news release announcing the airing of the Scott special, ESPN said: "Scott, one of the sport’s most iconic pioneers who is often referred to as the Jackie Robinson of motorsports, paved the way for minorities and women." It’s sadly ironic that when it comes to the Hall of Fame, Scott still can't reach the starting line. Jeff Burton is the latest Sprint Cup Series driver to re-sign with his current team in the last week. Richard Childress Racing announced on Tuesday that it had reached an agreement on a contract extension with Burton as well his the sponsor of his No. 31 Chevrolet team, Caterpillar. Terms of the deal were not disclosed. Burton and the No. 31 team qualified for the Chase for the Cup in 2010 and won one of this season's 150-mile qualifying races at Daytona International Speedway. Caterpillar has been a sponsor in NASCAR since 1993. Cat was a team sponsor in the Nationwide Series from 1995 to 1996 before moving to the Cup Series in 1997. Its relationship with RCR began in 2009. In 591 career Cup starts, Burton, 44, has 21 wins, 128 top-five and 237 top-10 finishes. He also has won six poles. NASCAR veteran Greg Biffle re-signed with Roush Fenway Racing last week. After winning his 70th career Sprint Cup Series pole last weekend at Talladega, four-time series champion Jeff Gordon offered some suggestions on how to make what has become a dull, long process of qualifying cars at Daytona and Talladega into something a little more interesting. "It felt like I could walk faster than I was going out there. The one thing that I mentioned to NASCAR when we were talking about it. It is the proper restrictor plate to be on the car for the race. I don't see, and I know that I am throwing out some things that our engine builders probably will not like, but I just don't see why we're not running a different restrictor plate for qualifying or a different spoiler. Something that NASCAR hands us that is the same for everybody to make it more interesting. "To me, that qualifying session was just a snoozer. It is because we are doing two laps by ourselves doing 177 mph. That had nothing to do with me. Anybody could drive that car at that speed. So let's make it a little more interesting. I don't see why we can't get up there into the 200 mile-per-hour range qualifying. I think they have done an excellent job with these cars making them safer; finding out what they do in the wind tunnel to stay on the ground when they turn around sideways say if a tire were to blow at that speed for whatever reason ... you ran over something. "I would like to see us qualify faster just to make it more entertaining for the fans as well as for us the drivers. We're not doing anything out there right now. It would be fun to go to Talladega or Daytona and the driver plays a little bit more of a role." Sounds like some good advice to me. Want to go for a ride with NASCAR drivers Kasey Kahne or Brian Vickers around Charlotte Motor Speedway? The Red Bull Racing teammates are encouraging their fans to e-mail in photos they'd like to be put on their respective cars for the May 29 Coca-Cola 600. Photos will be incorporated into the paint scheme on the bodies of the Nos. 4 and 83 Toyotas. 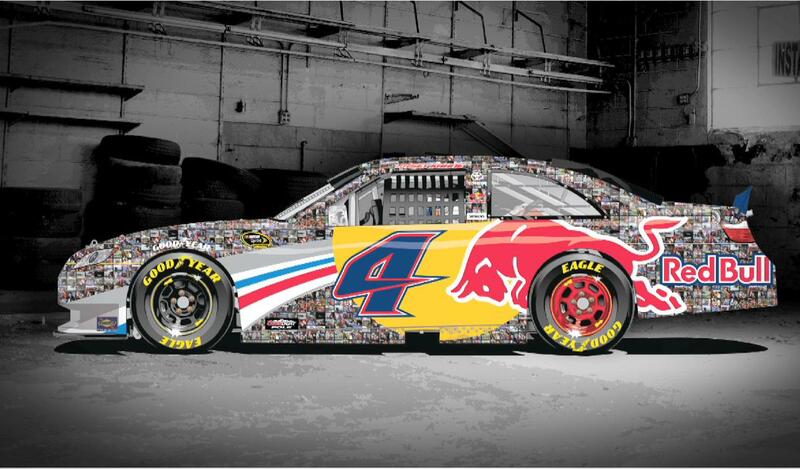 Fans can get an up-close look at the photos on the cars when they’re revealed at Red Bull Racing Fan Day at The EpiCentre in Charlotte on May 26. Log to www.redbullracingusa.com/shutterspeed and submit your photo. After your photo is entered, you’ll receive a bounce back message with a personalized code. Photos will be updated frequently leading up to the May 22 deadline. Check back to the site, enter your unique code, and you’ll be shown exactly where your picture landed on the Red Bull Racing Toyota that will speed around the track on May 29.
Who committed a NASCAR murder? This week, A&E’s police drama, “The Glades,” filmed an episode for their second season, set inside the world of NASCAR. The episode takes place at Homestead-Miami Speedway, as the show’s lead detective (actor Matt Passmore) does his investigation of a murder during a Ford 400 race weekend. Sprint Cup Series drivers Tony Stewart, Carl Edwards, Joey Logano and Brian Vickers all play themselves in the episode, which also features the Nos. 18 and 16 cars and a fictitious No. 74 Cup teams. In the episode, which should air in late June, detective Jim Longworth investigates a NASCAR-related murder, goes head-to-head with NASCAR's top drivers, and takes a few laps around Homestead-Miami Speedway. For info on show, visit www.aetv.com/the-glades/. NASCAR veteran Greg Biffle has agreed to a contract extension with Roush Fenway Racing, the Observer and ThatsRacin.com have learned. An official announcement of Biffle's extension could come as early as this weekend at Talladega (Ala.) Superspeedway, sources said. As recently as April 1, Biffle said he was "90 percent sure" he would re-sign with Roush and hoped to have a new deal completed by midseason. Biffle said he's not had an overwhelming interest to test the free-agent market, in part because of the economy, but also because of how far Roush Fenway Racing has come from this time last year. While Biffle is currently 18th in Sprint Cup Series points, his teammates Carl Edwards and Matt Kenseth have already won races this season. During his career with Roush, Biffle has won the Truck and Nationwide series championships and finished as high as second in Cup standings in 2005. He has 16 Cup wins, 20 in Nationwide and 16 in Trucks. A team spokesperson on Wednesday said she could not confirm Biffle had agreed to an extension. It’s way past time for NASCAR to clear up the controversy about its method of patrolling speeding on pit road. NASCAR uses an electronic monitoring system on pit road consisting of scoring “loops” to determine average speed between spots on the track. If a driver exceeds the announced pit road speed plus a 4.99 mph tolerance, a computer flags the driver for speeding. The problem has been that no one other than NASCAR officials in race control are allowed to see the computer results in real time, all the time. Competitors are shown read outs after the fact if requested. In order to help squelch an uproar started by driver Jimmie Johnson’s complaints, NASCAR allowed a Fox TV camera in race control last weekend at Texas to show video of a speeder getting caught (in this instance Tony Stewart). In addition, earlier in the weekend, a NASCAR official posted a picture on his Twitter account of the pit road speeding monitor screen. Yet still NASCAR refuses to allow media or fans the ability to see every driver’s speed every time in real time. In its effort this past week to try to defuse the controversy, NASCAR only made the situation worse. By officials posting pictures on Twitter of the screen and allowing Fox to video an instance of speeding, all NASCAR did was show it has the capability to show the results all the time. In turn, that just begs the question: If NASCAR can show the speeding results occasionally, why can it not show them regularly? Some sort of competitive advantage has been the usual reason cited, but NASCAR itself trounced that excuse by making exceptions to its long-standing policy this week of not showing the speeds. The simple answer here is NASCAR doesn’t want to show the speeds. What is still lacking is a legitimate explanation as to why. An interesting and relatively new dynamic debuted at the Daytona 500 this year - something NASCAR fans will likely hear a lot more of this weekend in Sunday's Aaron's 499 at Talladega (Ala.) Superspeedway. No, not talking about the two-car draft, specifically. Rather, it's the communication between what are supposed to be adversaries on the track that is now taking place in order make those two-car drafts work best. It's not just teammate talking to teammate. We saw Chevrolet driver talking to Ford driver, Hendrick drivers communicating with Gibbs drivers. All in the effort to be at the right place at the right time so that - surprise - only one of them can win the race. "We had a meeting this week talking about, you know, who you want to try to get on your radio, and it's pretty odd. I mean, typically it's teams that try to communicate within the team. But for a Childress car to be talking to a Hendrick car, or a Hendrick car to be talking to a Roush car, and a Roush car to be talking to a Gibbs car, we've never seen that. It's pretty interesting how that all is going down and who is going to who and talking and saying, can I put you in my radio. And with the etiquette: When do you go to a competitor's radio frequency? All of that's a moving target. I don't know, I'm a fan of it because I think honestly it's safer doing it with one spotter and two cars. I think it's actually safer. However, I'm not a fan of it because it's supposed to be us against them, you know. We are not supposed to be working together. It's a little bit weird in the sense that we are competitors or talking to each other; on the other hand, from the safety standpoint I think it's the right way to go. It's a pretty interesting time right now." It looks like this year's surprise Daytona 500 winner will make an appearance in the May 21 NASCAR Sprint All-Star race after all. Representatives from Wood Brothers Racing, sponsor Camping World, Charlotte Motor Speedway and Talladega Superspeedway will be on hand for a news conference on Tuesday at the NASCAR Hall of Fame to announce a two-race sponsorship deal for Trevor Bayne's No. 21 Ford. Camping World's Good Sam Club will sponsor Bayne in this weekend Cup race at Talladega and the all-star race at Charlotte, sources confirmed to the Observer and ThatsRacin.com. Bayne’s win in the 500 guaranteed him eligibility for a chance to win the $1 million top prize in this season’s all-star event, but his Wood Brothers team did not initially have the funding to field the No. 21 in the race. While the Wood Brothers did expand their Cup schedule after Bayne’s upset win, the team was not planning to stretch its funds to cover a non-points race. The Wood Brothers were already scheduled to run the Coca-Cola 600 at Charlotte, but at this time are not scheduled run the April 30 race at Richmond, Va., which would be the first race they miss this season. Will Dale Jr. be satisfied with second? It's a difficult position to be in. Dale Earnhardt Jr. hasn't been to Victory Lane in the Sprint Cup Series for 99 races, yet on the surface it might seem he should be happy to finish second, like he did Sunday at Martinsville, Va.
At the same time, if you seem satisfied with second, there will be those who question whether there is a "killer instinct" missing or some other magic key to victory. It's a no-win situation for Earnhardt - nothing new to him in his career. He has tried desperately to live a life and develop as a driver on his own while at the same time burdened by expectations driven by the memory of his very successful father, Dale Earnhardt Sr.
After the race Sunday, Earnhardt Jr. did a good job trying his best to explain his internal battle of appreciating a good finish while at the same time still looking for more. Here is what he said: "I did. But I was just doing the best could I do with the car and trying to make the best out of the situation. We had an opportunity to win the race. I'm disappointed that I didn't get the job done and it will probably bother me more and more as the night goes on. "But I'll probably think about it a million times what I probably could have done differently. You know, I think if I know what's best for me, I should probably have a good attitude about what happened today and probably go into the next race and use it as momentum and confidence, like any other good driver would do, instead of worrying about, you know, how close we came. I should be thankful and grateful that I had the opportunity I had today and for the opportunity I got to work with the team I'm with and to even be here competing, and take this momentum and take what looks like to be a better start to the season than I've had in a while to the next racetrack and just keep trying to plug away. "We gained a lot of points on some guys that were around us today. The 4 (Kasey Kahne) and the 56 (Martin Truex Jr.) had some trouble. We just need to try to put some distance on some guys and get ourselves the opportunity to be in the Chase when the time is up. Steve (Letarte) is a good crew chief and he's going to give me more opportunities like this I feel." It's becoming a tiring problem in NASCAR. Two out of the last three Sprint Cup race weekends have now included problems developing with new tires brought to the track by Goodyear. Basically, the new tires are producing unexpected results once the rubber meets the road so to speak - when tires are actually used on the track. At Bristol, Tenn., two weeks ago and again this weekend at Martinsville, Va., Goodyear brought new tires to be used by Cup cars to address problems that came up in last season's most recent visits to the respective tracks. That is absolutely the right thing to do. Goodyear is always working to address concerns teams have at each track and try to make the racing product better. Nobody around NASCAR - especially Goodyear - wants to see a bad product on the track. We don't know yet whether there will be a serious problem in Sunday's Cup race. It's possible the track could "rubber in" quite well in the Truck race and Sunday could go off without a hitch. At Bristol, NASCAR quickly decided to bring in other tires to be used for the race on Sunday. Even if Sunday's race at Martinsville works out great, there is still a disturbing problem that needs to be addressed. In both cases, Goodyear brought new tires to the track without any actual on-track testing done to it. I'm sure very good computer simulation programs were run and all the top people all agreed the right decision was being made. And there is absolutely no guarantee on-track testing of the tires would have predicted what happened at Bristol or Martinsville. Asked Sunday if track testing of the tire was the only solution, driver Dale Earnhardt Jr. said, "I don’t know what else you can do. How else do you put a tire on the track and make sure it works?" What I do know is this: The only way you can absolutely say you've done everything you could to make sure what you bring to the track is the right call is to have somebody run the tire on the track itself. It may not yield any different result. What it does do, however, is remove any doubt there was anything else that could be done to prevent problems in the first place. Isn't that the safer call? Kyle Petty's Charity Ride Across America won't stretch quite that far this year. The ride, which is schedule May 7 to 14, will consist of a trip down the East Coast. More than 175 drivers already are signed up and the group will begin in Lake Placid, N.Y., and conclude in Amelia Island, Fla.
"What began as a few friends having a good time riding has turned into what we have today. Once we got started, we decided we needed to give back to the towns we rode through, so we started donating to children's hospitals along the way," Petty said. "The past few years though, it's really enabled us to make a difference at Victory Junction. We've built a water park and sent hundreds of kids to camp all because a bunch of people like to ride. It's pretty amazing to me." In addition to 28 total fuel stops, riders will make overnight visits in Corning, N.Y., Farmington, Pa., Irvington, Va., Wilmington, N.C., Mt. Pleasant, S.C., and Amelia Island, Fla. during their 2,400-mile trek down the East Coast. Celebrities scheduled to join for all or part of the trip include ESPN NASCAR analyst Brad Daugherty, former NFL great and Heisman Trophy winner Herschel Walker and NASCAR driver and Bo-Dyn Olympic bobsled founder Geoff Bodine. Fans and spectators along the Charity Ride route may contribute through the Charity Ride's "Small Change. Big Impact." program, which accepts donations at pit stop locations. Fans may also follow Petty and the riders on several social media pages, including facebook.com/kpcharityride, twitter.com/kpcharityride, and twitter.com/kylepetty. Since the Charity Ride's inception in 1995, 6,850 participants have logged more than 9.8 million cumulative motorcycle miles and donated more than $14 million to Victory Junction and other charities that support chronically ill children. The 2010 Charity Ride raised enough money to send 180 children to Victory Junction for a five-day session free of charge.